View More In Specialty Knives - Page 5. TukTek Kitchen Cheese Knife Set of 4 Stainless Steel Knives 2 Pack w/ Bamboo Handles Cheese Slicer for Parties & Wine Tastings This cheese knife set makes a great presentation when serving and slicing cheeses at parties and gatherings. Features super sharp stainless steel cheese knives with bamboo handles. Comes with 2 forks, 2 mini knives, 2 small vertical slicers and 2 large vertical slicers. Makes a great gift. Keep one set and give the other away. Each cheese knife measures approximately 5" long. CAUTION: SHARP. 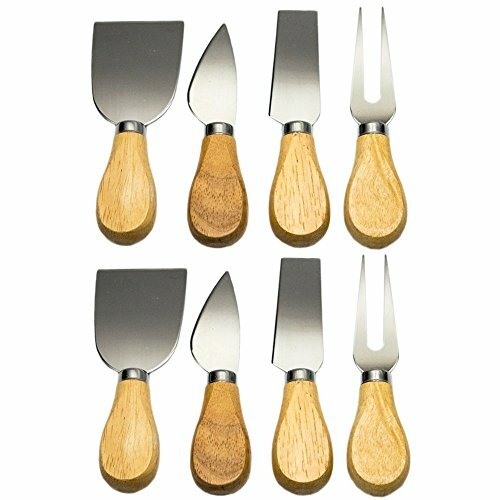 This cheese knife set makes a great presentation when serving and slicing cheeses at parties and gatherings. Features super sharp stainless steel cheese knives with bamboo handles. Comes with 2 forks, 2 mini knives, 2 small vertical slicers and 2 large vertical slicers. Makes a great gift. Keep one set and give the other away. Each cheese knife measures approximately 5" long. CAUTION: SHARP. If you have any questions about this product by TukTek, contact us by completing and submitting the form below. If you are looking for a specif part number, please include it with your message.